I’m a Type-A personality. I like schedules and lists. I like doing things on time at the same time every day. Kids have changed that about me. I’m still Type-A, but I don’t totally run my time anymore. I used to have a pretty good housekeeping schedule, but now I have a very flexible housekeeping routine. Let me give you a peek into my day. 7:30 a.m. Wake up time! I gotta have my cup of coffee before I do anything. I have such a hard time waking up and getting with it in the mornings. I check emails and drink my coffee while the kids play. 8:30 a.m. Breakfast. I like to serve a hot breakfast, but I don’t always do that. I clean up right after breakfast. Honestly, clean the kitchen as you go. It is so much easier to clean as you go rather than leave it for later. I unload the dishwasher from the night before and put the dirty dishes into it. I won’t run it til after dinner, though. I wipe down counters and sweep the floor. —Sometimes this stuff gets put off if the baby is fussy. I may not like putting it off, but life happens! 9:30 a.m. Everyone gets dressed for the day. I make my bed and tidy my room. I help the kids make their beds. 10 – 12 School time! We do our lessons and play outside. I will tidy the downstairs and start a load of laundry. I will switch out this laundry when I need to and bring the clean load upstairs to be folded and put away when I get to it. 12:30 p.m. Lunch followed by quiet time. The baby usually naps during this time. The rest of the day is free time. The kids draw, play, and usually watch a show. This is when I do the bulk of my chores and also when we do errands. I vacuum the entire upstairs rugs and make sure the kitchen is somewhat tidy. I usually start dinner prep around 4:30. Here’s the thing. Days rarely go as planned, someone usually throws a fit at some point. Sometimes the kitchen doesn’t get cleaned when I’d like. Guess what? It’s okay! I will get to it when I can. I do have chores I prefer to do daily and weekly. The kids are usually always helping and Bug has some of his own chores. Re-organize areas like the pantry and the fridge. All other big chores get done during big cleaning days or as-needed. I do keep lists of these things in my homemaking binder, though I hardly refer to it! After a while stuff gets repetitive and you just do what you have to do. 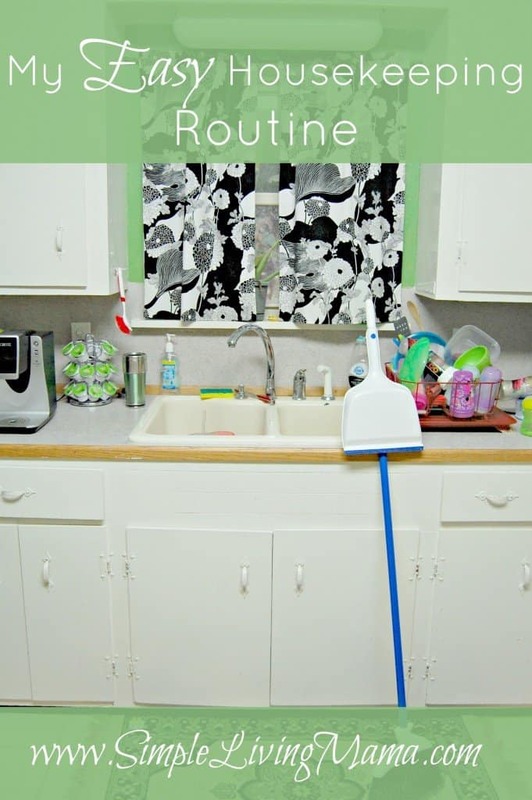 Do you have a flexible housekeeping routine? I’m sure you have things you do daily and weekly!